Home / News, Politics / Shock as OBADO escapes stoning and lynching in Kuria East - See what he did that forced him to cut short his speech and run for his dear life? Shock as OBADO escapes stoning and lynching in Kuria East - See what he did that forced him to cut short his speech and run for his dear life? 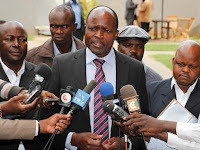 Thursday February 7, 2019 - Migori Governor, Okoth Obado, was forced to cut short his speech and run for his dear life yesterday after residents threatened to stone and lynch him in broad daylight. Obado was speaking at a function at Kegonga in Kuria East about a World Bank project meant to upgrade municipalities where he opened a maternity ward and launched the sub-county offices before hell broke loose. According to reports, Obado’s remarks defending his administration's choice of Rongo, Migori and Awendo towns as the beneficiaries of the Ksh516 Million project did not augur well with Kegonga locals who accused him of sidelining them. In his remarks, the Governor also accused Kuria East MP, Marwa Kitayama, of using the project to taint his (Obado) name. “I have tried to explain to my brother (Mr Kitayama) the truth about the World Bank project but he has refused to listen. He wants to incite the Kuria people against me so that they can think Obado is such a bad person. He is the only one who knows his aim of besmirching my name. "He is here and I do not want to speak behind his back. So my brother, on a sober note, let me tell you whoever you are working for, you will not succeed,” Obado lashed out. It is at this point that Kitayama mobilized his supporters to stone Obado, and if possible lynch him, for attacking him. On realizing what was about to happen to him, Obado hurriedly cut short his speech and ran.